"Sharp, quirky, and occasionally nettlesome", Walking the Berkshires is my personal blog, an eclectic weaving of human narrative, natural history, and other personal passions with the Berkshire and Litchfield Hills as both its backdrop and point of departure. I am interested in how land and people, past and present manifest in the broader landscape and social fabric of our communities. The opinions I express here are mine alone. Never had ads, never will. There are still a few giants of the lost elm tribe among us, though most of us pass them by without taking notice. There are a few folks around who remember the days when a squirrel could cross our busy main streets in the canopies of elms, but while there are more streets in the Northeast named "Elm" than "Main", the broad allees are long gone, their fluted vaults and columns fallen to a killer blight that still ravages wild elms and street trees but has yet not driven the American Elm to complete oblivion. The Elms are still with us, but few indeed of the most stately specimens. Still, some of these majestic trees remain along our village streets and country roads, and every year a few more succumb to the introduced pathogen Dutch Elm Disease (DED). This beauty above isn't sick, but just leafing out. 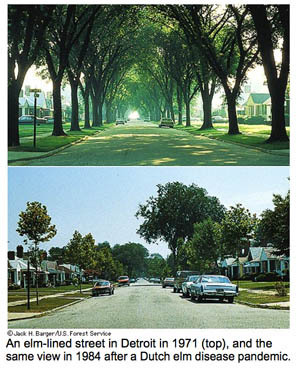 To get a sense of what we have lost, the USDA offers this striking comparison of an elm-lined street in Detroit and the same view after DED destroyed the elms. Look at those cars. There are only a few years , barely more than a decade, between these two images. There is an elm or two left in the bottom image, but chances are it too succumbed. Their roots were likely grafted together and transmitted the fungus from tree to tree, while both native and introduced elm bark beetles were vectors for its spread above. 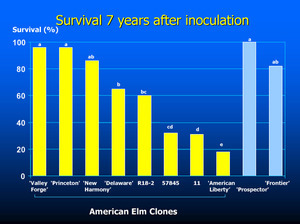 Nine years ago, my friend Tom Zetterstrom and I started Elm Watch because contrary to popular opinion, not all the elms were dead and there were things that could be done to give those still with us a fighting chance and replant disease resistant cultivars to succeed them. Tom is a gifted artist whose silver gelatin Portraits of Trees are in many important collections. Tom lives in a small house in my town that used to belong to his father, an arborist who once bought a two-man chainsaw to take down infected elms in the 1960s. One of the most extraordinary scenes I have ever witnessed - and readers of Walking the Berkshires know I have seen some some rare sights in my time - was the al fresco performance of an Ode to the Massachusetts Champion Elm on a Berkshire side street in Lanesborough, played in full Scottish regalia (of largely periwinkle blue) by a female piper who has performed at Tanglewood, and featuring instead of Tchaikovsky's cannon a chainsaw crescendo with Tom firing up his father's behemoth. Truly indescribable, especially if you are the one holding the handle at the front end of the bar - and I doubt a recording of this once in a lifetime performance exists. It does illustrate two truths, however; Tom has a touch of the madman (or saint) about him, and people are passionate about elm trees. Americans, particularly those with New England roots, have a long and very emotional relationship with the American elm (Ulmus americana). 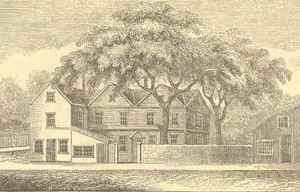 Boston's famous Liberty Treewas an elm, and they were planted in their thousands as the ultimate street tree because of their form, hardiness, and patriotic association. The cross grained branches are very resistant to splitting, which made the tree more useful for shade and as a thing of beauty than as lumber. 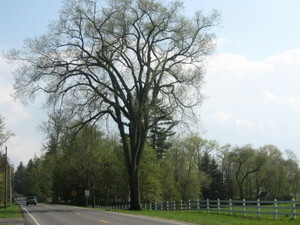 Elm Watch inspired people to "Adopt an Elm", which at $14 per inch diameter at breast height (dbh) paid for a fungicide injection of elms in the public viewshed. It might cost $500 to property treat a tree of 3' dbh but it lasted three years, and we got enough sponsors for more than 100 trees in the Berkshires, northern Litchfield Hills, and across the Taconics in Columbia and Dutchess Counties. Elm Watch had a small and long suffering volunteer board that Tom swept up and left spinning in his wake and played a major part in raising "Elm Awareness" and inspiring community forestry efforts in portions of three adjoining states. It also saw its mission as Elm restoration, spreading the word about the most disease resistant native elm cultivars and making them available to the public. For a while we had an informal slogan; "Give Me Liberties, and Give Me Death", a reference to the first and not particularly resistant cultivar, the Liberty Elm, which many had planted but found still quite vulnerable to Dutch Elm Disease, as this slide by Dr. Alden Townsend of the USDA's Agricultural Research Service illustrates. Tom and I were pleased to hear NPR's story last week about the widespread use of the highly resistant "Princeton" elm cultivar in restoration and Home Depot now stocking more than 12,000 of these trees in its retail stores. USA Today also had the story. We know that there is certainly a market for them. There is a Princeton elm growing on my street that I purchased and donated to the Town. Tom and I pruned it this year, as it has put on vigorous growth. The next planting was not an elm, however, but an American basswood, for diversity is desirable in street plantings as we have learned and relearned to our cost with other trees with other vulnerabilities. We now regret our zeal to replace the old elms in the 1970s with Bradford pear, for it has a nasty habit of dropping its weakly joined branches on cars and sidewalks, and the gargantuan silver maples on our street are now too large and rotten to the core. But a few elms, and some other hardy non-invasive trees, will shade our streets most admirably in the years to come. And thanks to the wider availability of disease resistant cultivars like the "Princeton" elm, now they can. Hi! We have an old elm tree in our back yard that we love. I am glad to hear others surviving. The tree has been here since we moved in 18 years ago and still going. I think because it is not close to any others. We have not had the funds to have it sprayed but we clear around it and take care of the tree itself. Every year we have had a Baltimore Oriole nest in it! We live on the shoreline in Connecticut in a town where all the elms on our Green were lost, so we hold our breath every year that the elm leafs out. We have a stately beauty just down the street that seems to be doing well. I picked up a sprig that had blown over to our porch in a rainstorm the other day. Most memorable elm experience: Just as the students were receiving their diplomas at my nephew's Trinity College graduation a few years back, a wind came up, and down came a shower of their tiny winged seeds across the campus green, a perfect commencement metaphor. You probably know that Harvard has an endowment to shore up the famous Yard elms while a new program of mixed species begins to replace them. What a great story about the Elm tree! As I understand it, disease was not the only thing that helped kill off our ancient Elms. In a number of cases when towns or cities began using gas, and installed pipelines, the leaking gas, plus reckless digging near the trees to put in gas and sewer lines, aided their demise. Among "the cream of the crop in Revolutionary War blogs" - Michael Aubrecht of "Blog, or Die." Chosen by Ralph E. Luker of Cliopatra as one of 80 blogs without which "history education on the internet would be seriously impoverished." Whether Invasive or Just In-Migrating; You Cannot Conserve the Status Quo.